Rep. Grove is joined by Pennsylvania NFIB members, including Steve Parthree of One-Way Janitorial in York, to introduce a package of bills that are designed to improve and simplify the tax code for small businesses. Creating a fairer business environment and allowing business owners to focus on growing their companies and creating more jobs. 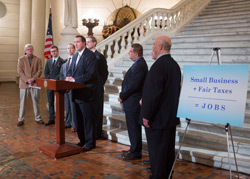 HARRISBURG – As thousands of Pennsylvania small business owners work to meet the demands of the tax deadline, Rep. Seth Grove (R-Dover) is joining colleagues in the state House and Senate to introduce a package of bills that will simplify current tax code, and create a fairer playing field for small business in Pennsylvania. Grove is sponsoring legislation that would allow a business that is generating a loss to offset that loss against other earnings for future years. It will help new small businesses who usually have a loss their first few years in business to stay competitive. It will also help existing businesses who hit a rough patch. Other bills in the package include a like-kind exchange, introduced by Rep. Steve Bloom (R-Cumberland), which would enable a business to sell its building or equipment, and immediately purchase another property or buy more modern technology without a tax penalty. In addition to a bill introduced by Sen. Scott Hutchinson (R-Vanango), which involve Section 179 depreciation taxes. The bill would accelerate the depreciation of expensive equipment in the first year, allowing businesses to have more money on hand for major purchases, and make up the depreciation costs in later years. The package of bills is supported by the National Federation of Independent Business (NFIB) and will soon go before to the House and Senate Finance committees for consideration.